Just like most people, I like spending the Christmas and New Year’s holidays with my family in my hometown or traveling abroad. Last year, I’ve been considering to take a two-week vacation to one of my dream destinations but due to some unforeseen and unfortunate personal circumstances that happened with my family, I urgently needed to go back to my hometown before the holidays. Good thing, I didn’t book that trip yet because I had to spend that money on more important things (like that emergency ticket back home and some bills). I just stayed in Singapore, went to work (except on Christmas day of course) while most of my colleagues were on leave. I spent my Christmas Eve at a friend’s house. And as for the New Year’s break, I thought I could still take a quick getaway without breaking the bank and without using any leave credit because our company is on a five-day shutdown from New Year’s Eve. I can still book a 5D4N trip, but where? Like I always do when looking for a destination, I opened the Skyscanner website and typed from Singapore, to ____ (blank, which means Everywhere). I browsed through the list of destination countries, I thought it will be nice to spend New Year’s Eve in Taiwan but when I checked from Agoda and Booking, most hotels were already booked in Taipei during those days. I had to look for another destination. And then from the list there was Maldives, I’ve never been to Maldives. As a beach lover, this tropical country has always been my on bucket list although I never thought of going to there alone. But I cannot think of any friend to bring along either so that means I am traveling alone again. No problem. But c’mon, who goes to Maldives alone?! Well actually, one of my friends did during her birthday and I thought she was crazy haha… But it was her birthday and she had no regrets. Before I decided to book the ticket, I asked her for tips and I also asked another friend of mine, who just recently went there with his friends. I also Googled, Maldives on a budget, and I found some great information on how to travel this country backpacker style in terms of accommodation, transportation, food, and activities. I recommend this blogger for his detailed itinerary and tips. After all the research, I have finally decided to book that ticket to Male, the capital city of Maldives, via Tigerair. At 385SGD (round trip), I think it’s a good price considering that it was during a high season and it was booked only two weeks ahead. And since I really intend to travel Maldives on a budget, I wanted to stay in a cheap and decent accommodation but still easily accessible by public transportation. 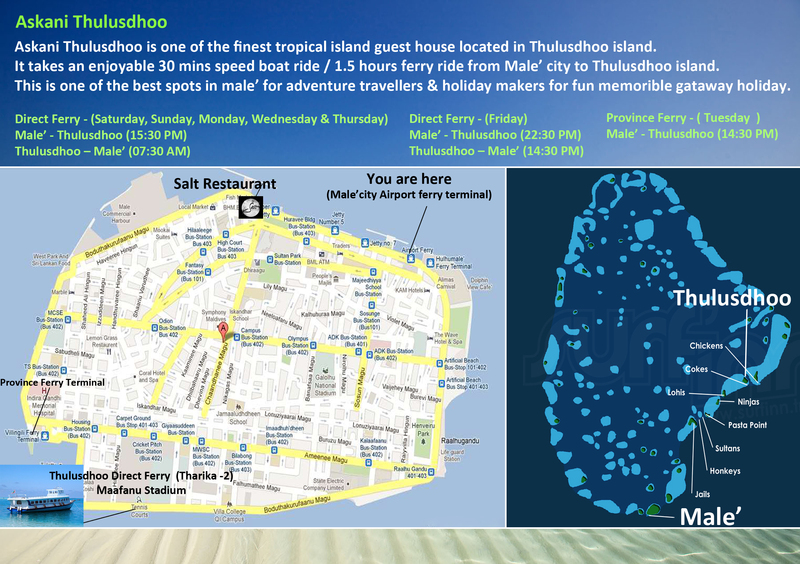 I found a guesthouse, located in the local island of Thulusdhoo, for 4 nights at 170SGD via Agoda. The immigration officer asked me, “Alone?” and I answered, “Yes”. I remembered my friend told me that she was held for some time at the airport when they found out she is traveling alone. When she showed them her identification card that proves that she is a professional working in Singapore, they let her go. Thankfully, that didn’t happen to me but the immigration officer gave me a suspicious look, I just kept my poker face on. I was ready to show him my IC in case but he let me go anyway. I guess people here are not used to seeing solo female travelers? Visa is free for all nationalities. Just fill up the immigration form, which will most likely be given to you by the cabin crew before reaching Male. Upon arrival, queue up at the immigration. Give the form along with your passport to the immigration officer. Bring US dollars. It is widely accepted in Maldives. You will need this to pay for excursions and some restaurants. Although you can also tell them that you prefer to pay in local currency. Exchange some money into local currency at the airport. You will need need this to pay for ferry, food, some groceries, and tips. I’ve read somewhere that the Wi-Fi in the guesthouses are not very reliable. I bought a local sim card with data at the airport for 15USD. The airport ferry going to the capital city, Male, costs 10MVR. The standard taxi fare to anywhere in Male is 25MVR so don’t get ripped off. This is a shared taxi so don’t be surprised if the driver picks up other passengers along the way. To get to the local islands, you can either travel by speedboat or by public ferry. Public ferry is cheaper but the journey will take longer and you need to understand the tricky ferry schedule. If you are landing in Male after your scheduled ferry departure, you may need to stay overnight in Male or Hulhumale so that you can take the ferry the next day. Tharika-2 is the direct ferry to Thulusdhoo. It leaves at 3:30PM everyday except Friday. The ticket costs 32MVR. Buy the ticket as soon as you reach the terminal, which is my mistake because I didn’t. Luckily, they still allowed me to board the ferry without a ticket and I just paid the ticket while on board. The only problem in not buying the ticket in advance is that you need to stay at the upper deck under the heat of the sun. Later on, the captain allowed some of us to come inside. How can I refuse that? Upon arrival, I was met at the Thulusdhoo jetty by the staff from my guesthouse, Askani Thulusdhoo. He told me that there will be a cultural dance show with buffet / New Year’s Eve party that I can join for a fee of 20USD. He also noted that there will be no alcoholic drinks – this is Muslim country, no alcohol everywhere except in island resorts. No biggie, I rarely take alcoholic drinks anyway. I gladly agreed to join the party so that’s how I spent my New Year’s Eve in Thulusdhoo. I shared a table with some nice Russian ladies after the show we were all dancing with the locals. It was a simple New Year’s Eve celebration, no fireworks but we all had fun. My New Year’s Day was spent on snorkeling and sandbank excursion (60USD + 10USD snorkeling gear) which I booked from my guesthouse. I also did a bit of exploring in Thulusdhoo before and after the excursion. Thulusdhoo, also known as Cokes, is actually a famous surf island in North Male Atoll, Maldives. They say that Cokes was named by Australian surfers way back in the 70s because of the Coca-Cola factory in this island became the first in the world that produces Coke from desalinated water. By the way, bikinis in any public beach of Maldives is prohibited because again, this is a Muslim country. Bikinis can only be worn during excursions to resorts and sandbanks. But some local islands, like Maafushi has a covered beach area where foreigners can wear bikinis. Thulusdhoo doesn’t have this covered beach area, but I still saw some foreigners wearing bikinis on the beach anyway. Just don’t walk around the island in a bikini so that you don’t offend the locals. I found this humble milk shake shop in Thulusdhoo while I was desperately looking for a place to eat after my snorkeling and sandbank excursion. I like their banana milk shake so I went here twice. The marine life in Maldives is beautiful so snorkeling is must! If you can’t swim, then use a life vest though I prefer snorkeling without a vest so that I can swim properly and go down deeper. I scraped my knee on one of the corals, ouch! Going to a sandbank after snorkeling is a great way to relax after being underwater (and struggling for air). We have this empty beach all to ourselves… So idyllic! In Maldives you can get the luxury resort island experience without actually staying there. My guesthouse offers a resort excursion to Club Med Kani. I just have to pay them the speedboat transfer and pay the entrance to the resort. Luckily, I got to share the speedboat with a family, who were also Filipinos by the way. Shared speedboat means the cost of the transfer will divided among us – lucky me, because I cannot afford to pay the full price. We paid 22USD each for the speedboat transfer. As for the entrance fee to Club Med Kani, it is 118USD inclusive of breakfast and lunch buffet and some alcoholic drinks. What a great deal! This heron is enjoying the view as much as I do. Life is beautiful, embrace it! Thank you Club Med! I enjoyed my visit! The last activity I booked from my guesthouse was spent at Kuda Villingili aka Chickens, the picnic island near Thulusdhoo. I spent 40USD for the shared speedboat ride (with a lovely Russian family), entrance fee, and lunch. Chickens, just like Cokes (Thulusdhoo), is another famous surf island. It was named Chickens by surfers because there used to be a chicken poultry farm in this island. It was a day well spent with two wonderful families: Maldivian and Russian. We had BBQ lunch of freshly caught fish courtesy of the Russians and afterwards we explored the this uninhabited island together. Later that night, back in Thulusdhoo, we also had dinner together. Spent my last night in Thulusdhoo with the Maldivian and Russian family. I bought this huge fish for us. Now this concludes my trip New Year’s holiday in Maldives. For a short time, I did not just see the beautiful beaches and coral reefs of Maldives but I also had an opportunity to blend in with the locals and other foreigners. I don’t think you can experience that if you just stayed in an exclusive resort. I had such a great time that I never really felt alone even though I was on a “solo trip”. I hope somehow I gave you some ideas on how to travel Maldives the cheaper way. If you have never been to this country yet, now is the good time to visit as the country is becoming more popular to budget travelers. Anyone can visit the Maldives now, it is no longer exclusive to the rich. Goodbye Maldives, I will come back for sure! Hi Angela! Visa is free for all nationalities and is issued upon arrival. Just bring some proof that you will be returning to the Philippines like for example your school ID — that is in case they become suspicious. But if they don’t ask you then that’s great. In most cases, entry should be easy. Shorts and sleeveless are fine. Just don’t show too much skin. And walking around in a bikini is not okay unless you are in a resort or in a bikini beach. And oh, take note that Ramadan begins on June this year. The locals will be fasting during that period. So if you intend to stay in an inhabited island like Maafushi or Thulusdhoo, careful not to eat or drink in public (as respect to their culture). But of course you can still eat in restaurants and in your hotel. Just don’t walk around the island eating (like a bag of chips). This is based from my experience because the second time I was in Maldives was also during Ramadan (June 2015). My boyfriend was scolded because of drinking coconut juice while we were in a playground LOL. Would also appreciate your travel insights on the second trip you did. Perhaps you explored another area ? Thanks and safe travels always ! Hi. I want to go here alone, as well. My only concern is the language barrier. Do they speak English, too? Language barrier should not be an issue when travelling. I’ve been to Japan, Thailand, Myanmar, Cambodia, Vietnam, Nepal, etc. where little English is spoken. Generally, people working in the tourism business can speak good English. And yes, Maldivians speak English. What camera did you used? Very helpful post of your experience, nice pics and detailed tips..I will read it through again later! It’s gorgeous! Go for it!